President Obama will deliver his fourth State of the Union address Tuesday evening. Photo by Jim Watson/AFP/Getty Images. President Obama will deliver his fourth State of the Union address Tuesday evening, laying out the policy pieces to fill in the sweeping vision he put forward at his second inauguration a little more than three weeks ago. The speech, which the administration has billed as a bookend to Mr. Obama’s remarks last month, is expected to focus on the economy and the middle class. But most of the attention following the address will likely center on what the president had to say about key second term initiatives such as reforming the immigration system, reducing gun violence and addressing climate change. White House press secretary Jay Carney made the case Monday that jobs and the economy, which public opinion polls show are the top concerns of most Americans, remain issues of primary importance to the Obama administration. “It is simply a fact that while the inaugural address contained within it very powerful lines from the president about issues like comprehensive immigration reform or the need to address climate change or gun violence, all of those issues combined got less space, if you will, in the inaugural address than the economy and jobs. And that reflects the overall approach that the president takes,” Carney told reporters at the White House. “It also reflects the fact that when you talk about an issue like comprehensive immigration reform, we’re talking about an economic issue,” he added. Carney will appear on Tuesday’s NewsHour at 6 p.m. 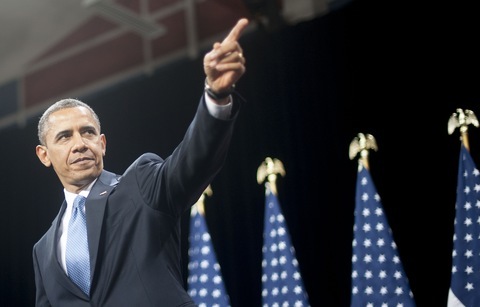 ET to offer a more concrete preview of Mr. Obama speech, which begins at 9 p.m. ET. When it comes to pushing his plan to curb gun violence, Mr. Obama will likely rely on emotion to convince lawmakers to act. Among the invited guests of first lady Michelle Obama are the parents of Chicago shooting victim Hadiya Pendleton, who was killed in last month about a week after her high school majorette squad performed at the inauguration festivities. The Washington Post’s Emily Heil profiles another of the first lady’s guests, Desiline Victor, who will be the face of voting delays. Victor, a 102-year-old Haitian immigrant, waited in line for three hours to vote at her North Miami polling location. Democratic lawmakers are doing the same thing, with Rep. Luis Gutierrez, D-Ill., inviting an illegal immigrant as his guest and several members inviting victims of gun violence and their families to push their points from the seats above the chamber. The first selectman of Newtown, Conn., and two of the first responders from the Sandy Hook Elementary School shooting will be guests of the state’s two senators, Richard Blumenthal and Chris Murphy. Sen. Dianne Feinstein, D-Calif., who is attempting to reinstate an assault weapons ban, will host Josh Stepakoff as her guest. In 1999, at the age of 6, Stepakoff was shot in Los Angeles by a white supremacist who used a semiautomatic assault rifle. Now a 20-year-old college student, Stepakoff works with gun control groups, Feinstein’s office said. As lawmakers spill into the U.S. Capitol’s Statuary Hall to react to the speech, Mr. Obama will speak with loyal political backers on a conference call to urge them to help further his legislative agenda. Jon Carson, executive director of the Organizing for Action group spun off the 2012 Obama re-election campaign, emailed supporters with details. “On the call, the president will talk about his plan for moving this country forward — and how you can help put his words into action,” Carson wrote. Mr. Obama will hit the road, as well, to sell his message, with plans to give speeches in Asheville, N.C., on Wednesday, Atlanta on Thursday and Chicago on Friday. The official GOP response will come from Sen. Marco Rubio, R-Fla., who will tape his response at the Capitol and deliver remarks in both English and Spanish. Tuesday’s tidbit from NewsHour partner Face the Facts USA looks at how the State of the Union evolved from a letter to Congress to an annual hullaballoo. The Constitution notes only that the president “shall from time to time give to the Congress information on the State of the Union.” Thomas Jefferson felt it was too king-like, and it wasn’t until 1913 that Woodrow Wilson revived the live speech. Don’t miss the NewsHour’s State of Our Union project. We revisited guests we’d met over the last year to see how they are doing. From finding — or not finding — jobs to new hope for the future, they shared their feelings ahead of Mr. Obama’s big speech. On Tuesday night, the NewsHour will livestream the pre-speech festivities, the address and a Google hangout with everyday voters, journalists and historians. Follow along here. On your PBS affiliate you can watch Judy Woodruff analyze the speech with Mark Shields and David Brooks. The Daily Download segment is back for a new series of conversations exploring how the digital world affects not just politics, but the culture we live in. Christina is moderating the discussions with Howard Kurtz and Lauren Ashburn from Daily Download. On Monday night, they talked about the expanding phenomenon of “liking” something on Facebook, and how some people get so overwhelmed they actually quit using the site altogether. You can join our conversation. Have you ever given up Facebook? Why, and what did you learn from the experience? Tell us your story. While we’re on the topic of Facebook, check out this amazing story out of Omaha, Neb., about how one Facebook photo of a fire set the Internet ablaze with rumors. North Korea conducted its third nuclear test Tuesday, which, according to South Korea, was stronger than its two previous tests in 2006 and 2009. Mr. Obama quickly condemned the test, and the United Nations Security Council convened an emergency meeting this morning. The United States dispatched aircraft sensors to determine whether this was North Korea’s first test using uranium. The Washington Post previews the expected grilling Treasury nominee Jack Lew will face from Republicans about his time at Citigroup. Sen. Jim Inhofe, R-Okla., the top Republican on the Armed Services Committee, told the National Review Online’s Robert Costa on Monday that he will “postpone” a full Senate vote on Chuck Hagel’s nomination to be the next secretary of defense. “Hagel may be passed out of the committee, but it’s going to be a long, long time before he hits the floor,” Inhofe said. In a closed door meeting Monday, Sen. John McCain, R-Ariz., warned fellow GOP members of the Armed Services Committee against using delay tactics on Hagel’s confirmation. Committee member Kelly Ayotte, R-N.H., came out against Hagel in a New Hampshire Union Leader op-ed. The House Republican Conference has put the brakes on a plan to translate State of the Union reactions from GOP lawmakers into Spanish. The effort, dubbed GOP en Espanol, was put on hold over objections from Reps. Steve King, R-Iowa, and Jim Sensenbrenner, R-Wis. But they did launch @GOPEspanol on Twitter. David Farenthold illuminates in the Washington Post why some lawmakers take spots on the aisle hours before the big speech. And Roll Call’s Emma Dumain reports on the preparations Hill staffers have been making for days. Interact with Capitol Hill? Print out Roll Call’s Fabulous 50. It’s a must-use resource of everyone you need to know. The Sunlight Foundation takes a look at state and federal political donations given by gun rights and gun control groups since 1989. They found a lopsided result: $28.3 million from gun rights groups and $1.9 million from gun control groups. In a video released Monday, MoveOn.org asked lawmakers to stop taking political donations from the NRA. The arms of the House Democrats’ and Republicans’ campaign teams are staffing up. Roll Call’s Shop Talk column has the roundup. Sen. Jeff Flake, R-Ariz., implored his former colleagues in the House not to jump to conclusions about a coming immigration bill, the Arizona Republic reports. Former Florida GOP Chairman Jim Greer pleaded guilty Monday to money laundering and theft charges. Phil Bronstein profiles the Navy SEAL who killed Osama bin Laden in the March issue of Esquire. And now there are two: The Republican field in the Massachusetts special senate election is about to get more crowded with former Navy SEAL Gabriel Gomez set to announce his candidacy Tuesday in a web video. He has until Feb. 27 to collect the signatures he needs to qualify for the April 30 primary. Say it ain’t so. Maker’s Mark announced Monday it plans to water down supplies of its bourbon in order to meet increased demand. The NewsHour’s Student Reporting Labs talked with young people about their views ahead of the State of the Union. Watch that here or below. Our detailed coverage of the pope’s resignation. The NewsHour asks you to share what you remember from when the Voting Rights Act became law as part of our coverage of the Supreme Court case this month that challenges the act. Here’s more on this storytelling-via-voice-mail project. To call in your own story, dial 703-594-6PBS. GOP says their hashtag for #SOTU is #NotSerious. Would also ask that you stop calling them #NotShirley. Cassie M. Chew, Katelyn Polantz and Politics Desk Assistant Simone Pathe contributed to this report.